The Sparrow is a book that is not afraid to ask the big questions - what does it mean to be human? To love? To believe in something? But what is so captivating about it is the way it asks these questions. Russell treats her characters with compassion and respect, all while weaving an engrossing story about aliens. 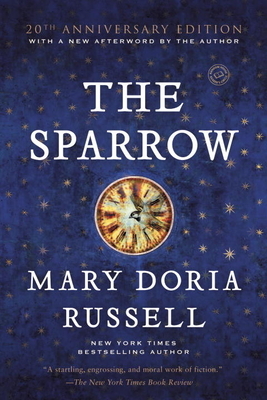 Mary Doria Russell has been called one of the most versatile writers in contemporary American literature. Widely praised for her meticulous research, fine prose, and compelling narrative drive, she is the New York Times bestselling and award-winning author of The Sparrow, Children of God, A Thread of Grace, Dreamers of the Day, Doc, and Epitaph. Dr. Russell holds a Ph.D. in biological anthropology. She lives in Lyndhurst, Ohio.